You have found a nice Node Group you like to use in a .blend File you’re working on. How do you get this inside this .blend to use it? You may want to have Node Groups that you use all the time just right in Blender if you start it. For this we can use the startup.blend file that Blender uses to load your default Scene. Now we have the Node Group in your default Scene, but it’s not going to be saved if it’s not used. To change this we can add a Fake User to this Node Group, so it will be saved regardless if it is used or not. This works for anything, btw. In Node Editor add the Node Group (Add – Group – Name of Node group, might need to add Material/enable Nodes first). Then you see you Node group, and where it’s Name is right of it the F, click it. Now we have to save this as default Scene. To do so: click File – Save User Settings. Done. Second Way is a bit more technical. Go/set Area to Outliner (The Area os Screen where your Objects are Listed), and set the Selector to Datablocks. Now find in there Node Groups, expand it by clicking on +, find the Node Group name, expand click + again, Find Fake User and click Checkbox to the right of it. Set Selector back from Datablocks to what you like. Now we have to save this as default Scene. To do so: click File – Save User Settings. Done. I showed you this cause the Datablock is sometimes a very useful tool, that at least i myself didn’t just stumble upon. Are some of these node groups seen in the image available somewhere? They’re look extremely interesting..
i plan to release some or all of them… Just have to find a way. I probably have to clean them out before release, some are messy, some are incorrect. Would you prefer a release of all of them in one go, and then maybe explain some of them in future Posts? Or better release one at the time with deeper info? Thanks for your answer… Well, it would be awesome if you could share them, even at their current “alpha” state. This way you could explain and update them eventually, when you had time; and we could study them and play around. pretty nice. The thing they still need to work on is group inputs. 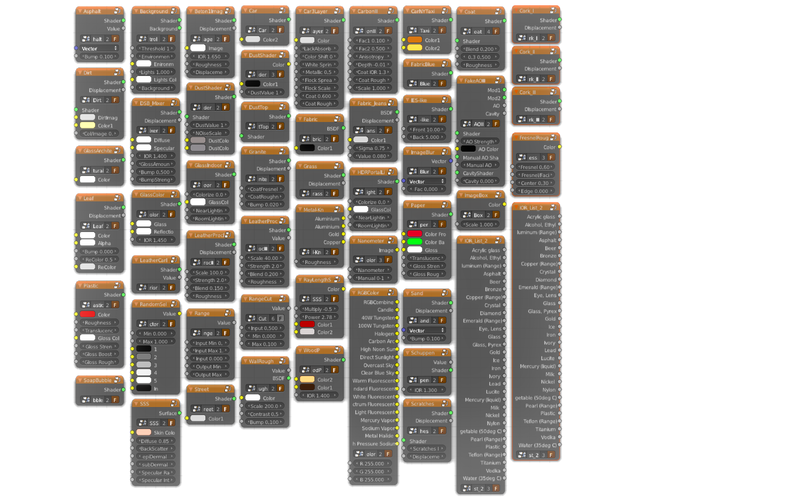 I want to be able to create really powerful nodes like the premade ones, with checkboxes and this stuff. 😦 Sadly, this doesn’t open for me in blender 2.72 or 2.71 (Mac). I’d love to see these. Is there something I could try, maybe a certain older version?